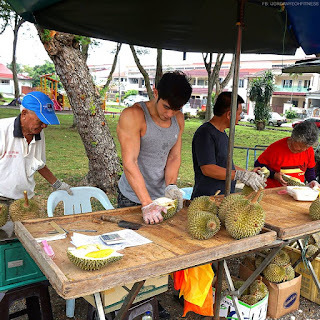 Hottest Hunks: Jordon Yeoh : The Hunky Durian Vendor. WHEN Jordan Yeoh offered to help out at his friend’s durian stall, little did he know the storm he was going to cause on the Internet. The 28-year-old from Petaling Jaya now stands as an Internet icon alongside attractive Taiwanese Tau Fu Fa seller Yi Tin Chen, good-looking Brazilian subway security guard Guilherme Leão and handsome Japanese reporter Daijiro Enami. On Sunday, the personal trainer posted 10 images of himself helping his friend’s parents sell durian in Section 19, Petaling Jaya. The Facebook post went viral with more than 18,000 shares in four days. No doubt netizens were keen on spreading news of his helpful nature. The whole story began when Yeoh, a self-proclaimed durian fan, started a new diet. “I am dieting because I want to lose some weight to get more defined. When I am dieting, I restrict fruits but I love durian and have not eaten it in a long time. So I was craving for it,” he told The Star Online. For his weekend “cheat meal,” Yeoh headed out to his friend’s durian stall. “Then I thought, why not do something a little bit different? Instead of just eating, I asked if I could help out a bit,” said Yeoh, who emphasised that he was not a durian seller nor did he have expertise in handling the fruit. “I did not want to impose on them (his friend’s parents). What I did were easy things such as opening up the fruit, throwing away the husks and serving customers,” he said. Shortly after posting the images, Yeoh received a flurry of messages that overwhelmed his inbox. “(The messages came) from women, men, people who are in the fitness line and who want to build good physiques,” he said. He even received messages from “uncles” and senior citizens who were interested to get into fitness and were looking for tips. It was also a good opportunity for Yeoh to get in touch with friends he had not spoken to for years as many contacted him when they saw the images. “I had mixed emotions. I’m happy and excited of course but at the same time I’m worried because I don’t know how to handle this situation,” he said. “Many people think too much of what is the best exercise, what is the best diet, what is the best so-called secret exercise to lose weight. But none of them will work if you don’t take the first step, which is to commit,” he said.